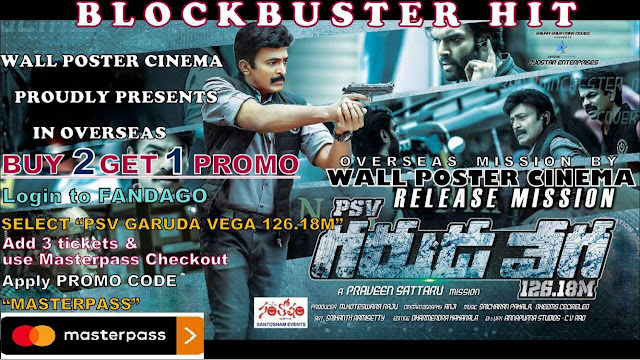 PSV Garudavega 126.18M is receiving a thumping response at the overseas boxoffice. All major locations are reporting sold out shows. Book your tickets in advance and enjoy the the thrilling Blockbuster of this season at a discounted price using Either Fandango or MoviePass. 5. At payment section,use other payment method and select Masterpass option, enter promo code as 'MASTERPASS'. Discount will be automatically applied for 1 ticket. 4. CA ,San Jose - Towne 3 cinemas , 95126.